It would be too easy to dismiss Marilyn Manson as a relic of the ’90s, a simpler time when anyone who paid lip service to attacking family values while name-dropping Church of Satan founder Anton LaVey could spark national outrage. That assessment was complicated by his namesake band’s 2015 album “The Pale Emperor,” an unusually restrained record that revealed the beguiling songcraft behind Manson’s shock-meister shtick. “Heaven Upside Down” aims to continue that late-career renaissance by mixing the suave poise of “The Pale Emperor” with the scorched-earth industrial metal of “Antichrist Superstar.” Even when Manson’s antics threaten to overwhelm everything around him, there’s a lot to enjoy here if you don’t take any of it too seriously. At first, “Heaven Upside Down” follows a familiar Marilyn Manson template: Sheet-metal guitars hammer away while Manson shouts theoretically inflammatory incitements to violence and the rhythm section marches in lockstep. Try as they might, the band’s wall of noise can’t hide Manson’s lyrical shortcomings — not when he puts the biggest groaners (“SAY10,” “JE$U$ CRI$I$”) right in the titles. The puns are still preferable to his attempts at social commentary; decoding the tangle of Old Testament imagery in “SAY10” yields nothing more profound than Manson’s usual entry-level nihilism. The industrial pummeling may start the album with a bang, but it’s a relief when “Heaven Upside Down” shifts into a lower gear for its second half. Guitarist, keyboardist, and film composer Tyler Bates, co-producing with Manson for the second album in a row, brings a rich sense of atmosphere to “Heaven Upside Down”; it sounds as crisp as the black-and-white cover portrait looks. “KILL4ME” strikes the same louche disposition as “Pale Emperor” highlight “Third Day of a Seven Day Binge,” while Manson has a blast slithering through the cheeky “JE$U$ CRI$I$.” When he’s not laying on the affectations too thick, Manson can be a very effective singer, as on the goth ballad “Blood Honey” and the two almost-conventional rock songs that close the album. 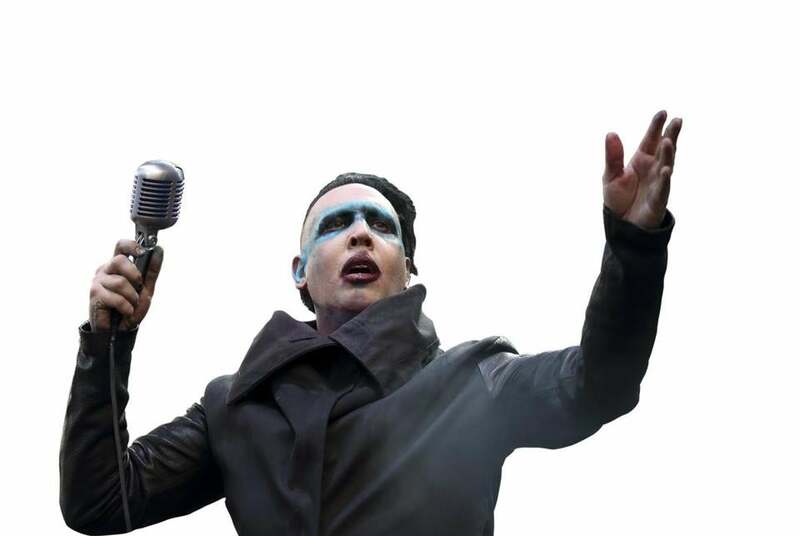 These more subdued tracks allow Manson’s personality to shine through without beating listeners over the head with his self-proclaimed darkness. At a svelte 10 songs and 47½ minutes, “Heaven Upside Down” is the shortest Marilyn Manson album yet, avoiding the overstuffed redundancy of past efforts. No one expected this band to be doing some of its best work 20 years after it first shook up the zeitgeist, but here it is, continuing to evolve while toning down its more dated or cartoonish aspects. It just goes to show that a good album beats a good scandal every time. @globe.com. Follow him on Twitter @terence_cawley.